Chef de cuisine Kamil holds the fort in the kitchen, keeping the menu fresh and creating fantastic daily specials using only the finest of local produce. The Front of House team will make you feel welcome and ensure you thoroughly enjoy your dining experience, whether you just pop in for a coffee and a pastry or come to enjoy an indulgent three course dinner. The restaurant is a favourite for private parties because of the very tasteful décor and friendly family atmosphere and bookings should be made early to avoid disappointment. 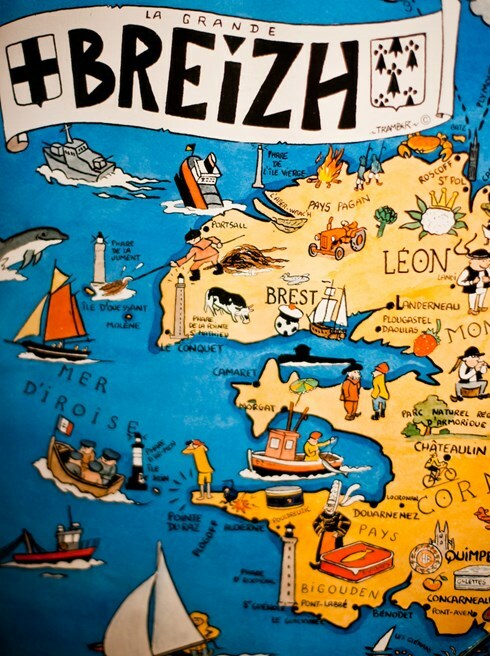 One of the most unique national flags is that of Breizh (Brittany). The design has been taken from the ermine motif which dates back to 1213 and was created by Morvan Marchai in 1923 who was a founder member of a nationalist movement called Breizh Ato or “Brittany Forever”. Marchal’s inspiration is known as the “Gwen ha Du” or black and white and incorporates two Breton symbols that are almost a thousand years old. The flag was flown in public for the first time in 1925 and was approved as the regional flag of Brittany in 1997. The four white stripes of the flag represent the Breton speaking counties of Lower Brittany and the five black stripes represent the five predominantly French speaking counties of Upper Brittany. In the ninth century, Breton warriors were identified by their shields which bore these two colours and the design was like the reverse of the Cornish Flag. It is possible that these colours relate to the fact that Cornish émigrés arrived in Brittany in the sixth and seventh century.